Are you planning the ultimate summer cocktail party? Do you long to unwind on a hot tropical beach with a cool drink? 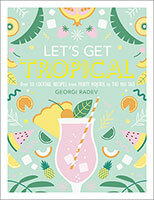 Bring a taste of the tropics to your home with Let's Get Tropical. ? Celebrate summer with over 50 fabulously fruity tropical drinks from Tiki Mai Tais to Cuban Mojitos. Discover the origins of these classic cocktail recipes and get the low down on rum, tequila and other popular exotic spirits. If you need a break from the booze, many recipes feature a lose the booze option with all the fruity flavour but none of the hangover. Non alcoholic cocktails can be just as fun! Learn how to mix your drinks like a pro, make delicious, homemade syrups and infusions and create your own flavour combinations. Featuring fun presentation ideas and twists on the classics, get creative and serve your guests a cocktail they will remember - if they haven't had too many Pina Coladas!Are you planning the ultimate summer cocktail party? Do you long to unwind on a hot tropical beach with a cool drink? Bring a taste of the tropics to your home with Let's Get Tropical. ? Celebrate summer with over 50 fabulously fruity tropical drinks from Tiki Mai Tais to Cuban Mojitos. Discover the origins of these classic cocktail recipes and get the low down on rum, tequila and other popular exotic spirits. If you need a break from the booze, many recipes feature a lose the booze option with all the fruity flavour but none of the hangover. Non alcoholic cocktails can be just as fun! Learn how to mix your drinks like a pro, make delicious, homemade syrups and infusions and create your own flavour combinations. Featuring fun presentation ideas and twists on the classics, get creative and serve your guests a cocktail they will remember - if they haven't had too many Pina Coladas!